"What do you want to watch, Dave?" Not sure what to watch on the box? Well next month Samsung will start selling a set that'll recommend what you might like, based on your viewing habits. 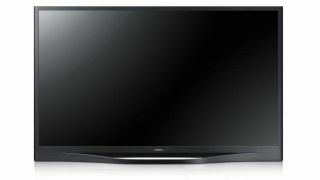 Known as S-Recommendation, the feature is part of the new Smart Hub user interface, found on Samsung's flagship F8500 LED TV, which will hit the UK in March. The set was unveiled at CES last month, but this is the first we've heard of a UK release date. We've contacted Samsung for a price, and will update this story when we hear back. S-Recommendation will scour broadcast TV, video-on-demand, apps, social content, and anything you've downloaded to your personal devices to find something suitable. It'll have Siri-style skills too, so it'll recognise what you're saying and find the relevant show or film, meaning you don't have to type. Which should save valuable telly-watching time. The F8500 is quite a looker, with what Samsung calls its "premium Magnum design". Basically, the TV frame and stand are a single structure, with a naturally-curved back made of the same material. The new Smart Hub features five panels: OnTV; Movies and TV Shows; Photos, Videos and Music; Social; and Apps. The user interface also works across tablets, so you can schedule and watch shows on your portable device.